gw2skills.net have updated their build editor so it’s time to theorycraft on some possible builds for the Elite Thief Specialization. My play style revolves around control, not necessarily about damage or high critical. However the Daredevil brings more to the table. Let’s take a look. Staff – this weapon is really made for PvE since it gives a lot of survivability in dealing with anything in PvE. You can literally bring this weapon anywhere and have a fun every time. Of course, my assessment is mainly based on what I see on paper since I have not had a chance to play with this weapon set, but in comparison to the weapons set I’ve been running all this time in PvE (S/D or D/D), this weapon is the most versatile. Channeled Vigor – I choose this heal because it has the shortest cooldown with added benefit of gaining more endurance. What do this translates for me is that, I can disengage, then get back into the fray in a short amount of time. The endurance refill would allow me to have a longer staying power since I wouldn’t have to heal as often. Basically, I’m taking this for the endurance refill and not so much about the heal. Bandit’s Defense – the value of this skill is the short cooldown. Even if they did change this from 10s to 15s cooldown, it is still the shortest cooldown for a stun break we get. This is the value of this skill, not so much about the block and counterattack. Distracting Daggers – this is a staple in any build in conjunction with the trait Impacting Disruption. Since it is easy to interrupt mobs in PvE, this brings a lot of DPS. However, in a boss fight, I would switch this up with Fist Flurry using the trait Staff Mastery instead. Signet of Shadows – a non-combat utility skill that should be switched to whatever the situation demands. Consider this slot an open slot. In my opinion, this should be switched with Signet of Agility during combat. Impact Strike – seriously, is there any other choice? Daredevil – it should be obvious why I’ve chosen these traits. However let me explain why Lotus Training instead of Bounding Dodger. They practically both deals AoE damage but the big difference is the radius of the effect. Bounding Dodger has 180 radius — which is too small — so in practice, unless the group you’re trying to target are hugging each other, you’ll only probably hit 1-2. Lotus Training has a larger radius of 600 while the trade-off is up to only 3 targets. 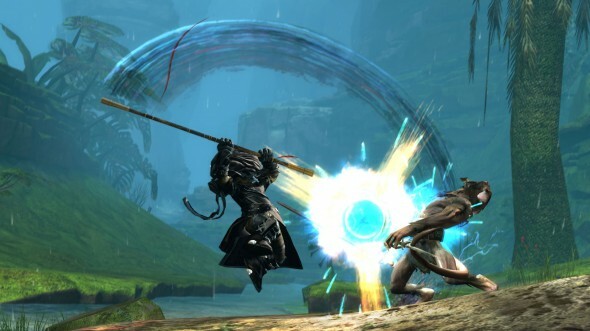 However, Lotus Training also deals movement impairing conditions which is a big plus in PvE. Critical Strikes – why CS and not Acro or DA? DA is a good candidate for the spot, however this trait line doesn’t bring much on the table. Sure Mug and Executioner are good picks, but these are not a consistent source of damage. CS brings a lot of Ferocity and access to Fury, which synergizes with Thrill of the Crime, that in my opinion weighs more than the damage that DA can provide. Acro, on the other hand, does give this build access to more vigor and endurance, but Channeled Vigor (and other Physical skills) can already fill this role. Trickery – this is a staple trait line that I would be crazy not to pick. Thrill, Bountyful, and Sleight are traits that make Thief remotely viable. Also, Sleight synergizes with Impacting Disruption as another source of interrupt. This is a work in progress. The idea is to give me a lot of staying power after capturing a node. However there’s no data on how will this build fare against other Elite Specs. I can already see this build being shutdown by GS Necro (my second pick for PvP) so this will require a lot more tweaking. It’s just too good to pass up — but we’ll see how things are after launch.